This entry was posted in Uncategorized and tagged design, knitting, petty harbour, rebrand, sock, socks by Rayna. Bookmark the permalink. Congrats my friend. First Light and a first step on a new journey. Congratulations on your re-branding! I love the Petty Harbour pattern – I think maybe it will be this year’s holiday sock pattern for my son. I can’t wait to see the next one, too! Tweeted and what a great pattern. The layout is pretty and clear. OK so I’m browsing Ravelry with my morning coffee and see these beautiful socks. And the pattern is free. And “needle agnostic” Hah! Thanks for the chuckle! But seriously the socks are gorgeous and I would use that beautiful blue yarn to make the socks. Thanks for the chance to win! Love the look of your blog and the banner photo is fantastic. That is a very lovely pattern for your Petty Harbour socks. I am always on the look out for suitable ‘man’ patterns! I’ve got a hank of ‘Dream in Color’ Everlasting Sock in the shade chili which is going to work up beautifully for your pattern, and thank you for the free pattern too. I love this colorway! It reminds me of Maine. That is the place I am wistfully longing for. Found out about this through Ravelry, where I am maralu. What a pretty sock pattern & a great name! Looks like a great unisex pattern that wouldn’t get too tedious to knit for my big footed brother who keeps bugging me for socks (if you knit a brother a pair of socks…). Headed back to twitter to retweet for you. Great picture by your dad! And The pattern is lovely too. I am in the mood for something non-stripey and not very complicated yet interesting for my next pair of bus socks and this looks like it’ll fit the bill nicely. Love the new branding, especially that iceberg picture! Those socks are going right in my queue! That blue is gorgeous! I live on the South Shore of Nova Scotia and it looks just like the water on a summer day. 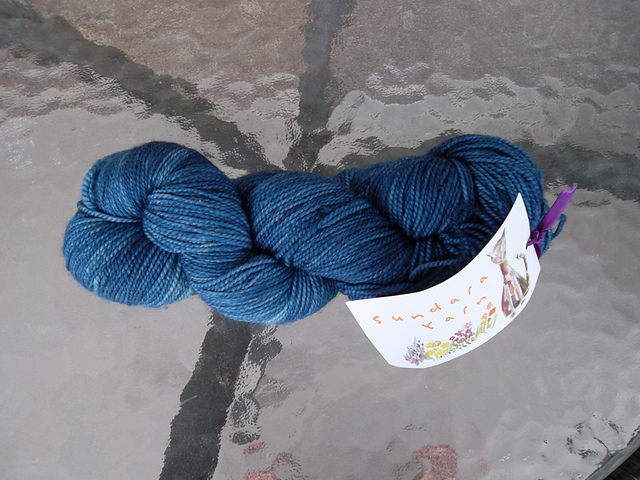 If I was knitting from my stash though, I think I’d use the CaribouBaa that just arrived in my from Indigodragonfly. It’s colour name is “Ooo….Shiny….” and it’s an icy silver-grey tonal. Love the pattern! Having made too many striped socks? I am ready for a bunch of solid colored socks, and that blue is ideal. blue is my favorite color! love the pattern, too! Congrats! The sock and the yarn are both gorgeous. Blue is my kryptonite – I can never resist a blue skein of squishiness. I think Petty Harbor would be perfect for this yarn, of course. The design and photography of your blog are so beautiful that even someone who couldn’t reas that you were an artist would know you were. The Sundara blue really speaks of the sea. I would use it and some companions for a striped shawl or a Breton jumper. Shared! Woo Hoo! This is so awesome! So happy to find your blog via Ravelry. I’m new to knitting socks and would love to try this pattern. I have a skein of Tanis in Spearmint that I totally think would work for this pattern. Congrats on the new site and the new pattern–looks good!!! Hi Rayna! Awesome! Love the name, First Light, too!! I’d knit socks for myself out of that Wistful Longing blue skein of loveliness! This is a beautiful new look to your blog, the header photo is really stunning. So much beauty in the world. Lovely pattern, I added it to my queue already! I have two skeins of Holiday Yarn FlockSock in my stash in Lochness and Sea Glass that would look fabulous with this pattern and also a skein of Lobster Pot Yarns Lobster Socks in Cape Sky! You might say I’m sticking to the theme! wow, this pattern and yarn are making me Wist(fully) Longing for the beautiful blue of the ocean at start of sunset. I think I would make these socks with the yarn, they scream out to be used together. Gorgeous! P.S. Love your site, Im a new follower!! The yarn is gorgeous and so is the pattern! Congratulations and off to favorite on Ravelry! Congratulations my friend, I would knit your sock pattern with the yarn and will share on Facebook as well. Ooh, such a pretty pattern, and hurrah for needle agnosticism. I’ll probably turn the pattern upside down because of still being new to making socks and having large feet so toe up suits me better. I’m planning on making them in a squooshy MCN from Maine, in the colourway Skerry, which apparently means small rocky island, and thus couldn’t be any more apropos for a pattern named after a Newfoundland town. Congrats Rayna! Pattern #2 yay. Love it and love the rebranding. Off to share on Facebook. Retweeted! I’m thrilled to see lots of love for your new pattern! I’d use the yarn to make a lacey shawl. Love the sock pattern “Petty Harbor”. Thank you. I look forward to making these. Best of luck with the new endeavors. I like the clear simple logo. I’d use that beautiful yarn to make a shawl. The Pretty Harbor sock pattern is really nice. That’s a very pretty sock pattern and a gorgeous skein of yarn! I’d certainly love to knit the pattern in that colorway. Given my sizeable sock yarn collection, I would even consider knitting a couple more pairs in different colors as well! The pattern is beautiful — perfect for socks for my husband! Love the new website and logo (your dad’s photography is amazing). Can’t wait to knit the new pattern! Oooh! Pretty! I would make socks, because as I write this my toes are frozen…. Love the pattern and the gorgeous watery blue color – looks like summer days on the shore of the lake. The first thing I ever knit was a pair of socks, and I have just rediscovered an interest in sock-knitting. Your new pattern will be my first for the magic-loop technique. Congrats on rebranding! I queued your pattern today even before I knew about your blog, it’s really nice! Meaning sea turtle in English. Your pattern would probably be in some Regia Neon yarn. I love your Petty Harbour pattern. I’m always on the lookout for something that works with variegated yarns and is patterned in a way to keep my interest. I’d probably knit the pattern in a variegated yarn from Blue Moon Fibers, Socks that Rock Lightweight. I’d save the Sundara yarn for a heavily textured or stranded pattern that doesn’t play nicely with variegated yarns. I love the new name, and the contest yarn is lovely. If I won, I would knit socks with it. Perhaps Hermoine’s Everyday, or perhaps Petty Harbor, which would only be fitting. The socks are gorgeous! The yarn might inspire me to make a first pair of socks! If I got the yarn, I would make the socks! 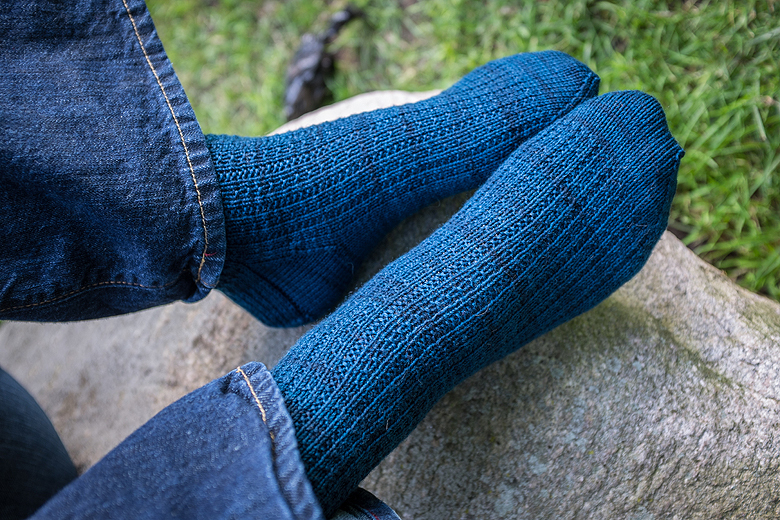 I love the socks and I think I have some Blueberry Pie Studio that would be just right! I’d use that yarn to make my husband a pair of your socks. Love the colour and your pattern. The blue socks have a lovely texture, thank you I have downloaded the pattern to my ravelry library, maybe one day…it looks like a nice, easy, impressive but not mad travel project. That skein of yarn looks great, I would LOVE to win it, sadly, if you really want to know what I would do with the yarn – most likely it would end up in the ‘too precious’ corner of my stash and stay there for a long long long time. OK, if I promise to knit it up into pretty cably-lacy socks within one year of receiving it, can I get a ticket in the draw pretty please? I love this pattern! I have shared this with my knitting group! If I won this yarn I would definitely use this pattern for it! Great job! Love the pattern, love the blue yarn and LOVE the SEA! I am a Maritimer too, living in NB, right on the Atlantic Ocean, there’s no smell so sweet as the salt water and no sound so soothing as the wave crashing against the shore. I will share your contest on my facebook page. Shared on Facebook Rayna and am now hunting to find the right needles and yarn to cast on Petty Harbour! Rayna – love the pattern, thank you. Love the new blog! If i were to score the yarn – I think a pair of your socks might be in order. My daughter would adore them. Thanks for the free pattern! I would make Petty Harbour socks with this yarn for sure! I would absolutely knit your Petty Harbor pattern. I love your Petty Harbor pattern and would knit it with the Sundara yarn. Although I plan to knit your pattern anyway. Love your new name! It’s awesome when you can keep a part of your heritage close. Lovely sock pattern – I’m tempted to knit it in a sunny yellow variegated yarn I picked up on a whim. But that blue is lovely too. Lovely yarn and the pattern is enticing. The blue suits it perfectly. Congratulations. Gorgeous! I’d love to knit the Petty Harbour socks in that yarn – such a good pairing. I love Petty Harbour; it’s already added to my favorites! I would definitely use that beautiful Sundara for socks! Your yarn looks lovely but I’m thinking of making it with this yarn for my dad for christmas – Hot Socks Mala http://www.ravelry.com/people/LaurieIsabel/stash/hot-socks-mala in an uneven striping brown/beige/grey/black – looks like a nice pattern for men who aren’t keen on anything “girly” so that is what I’ll be doing if I win! Thank you for the free pattern. I would use the Sundara yarn to knit your sock pattern. Finally making my over here to see the new look. LOVE it!!!! Love the new sock. I recommended it to a friend in one of the Ravelry threads because she is a new sock knitter and I thought the way you structure your patterns would help her. She thanked me and said she would be using it as her resource for all future socks. Score! I think I will be doing my Petty Harbours in a red, possibly my skein from a local dyer, or maybe one of my Hazel Knit reds. Or maybe the indigodragonfly merino nylon in Triplets & vampire s’mores because, well, Halloween is coming so it might be too perfectly timed! Oh, and I did retweet too, because hey everyone should see it! Best of luck with your patterns and your new brand! Honestly, I’m just gonna squeeeeeeeeze that yarn. 🙂 Oh, and maybe make some of those lovely socks! Thank you so much for the free pattern. Such lovely socks. i have yet to make a pair of socks and I think the pretty Petty Harbour may just be my starting pattern. Thank you also for the very generous giveaway of such beautiful yarn. I love those spectacular icebergs! Although I admire sock patterns, I don’t knit them as I’m just too rough on socks … I can go thru a storebought tube sock in just 4 or 5 wearings. But I do prefer sock yarn for my caps, as here in SF we seldom need anything heavier, and it’s easy to stuff into a pocket when you take it off. That blue is exactly the shade that gets my heart longing for the water. Thanks for the giveaway. KittenWhiplash on Rav. Love the new pattern. I would probably knit a shawlette with the beautiful blue yarn to go with my eyes. Love the new name and Newfoundland is a place I would love to see someday. The iceberg photo is amazing! I would knit a lovely blue cowl. Don’t know what I would make, but thanks for having this giveaway. I would make socks of course. I would knit beautiful Petty Harbor socks! I love the look of and the sentiment behind your blog. I would knit your Petty Harbor socks with this yarn; the blue reminds me of a clear winter sky in the mountains of Colorado (which I miss). I’m from Nova Scotia- miss the Maritimes every day. Love the color. And yes, I’m sharing! Congratulations! I’m not sure what I would knit with all that lovely blue, but I have been thinking of Christmas presents lately, so maybe a slouchy hat for my daughter. What a beautiful pattern! I also really like your new name! I would most likely knit a pair of these lovely socks out of the yarn! Thanks for the giveaway-mamagiff on ravelry. I would definitely make a pair of cabled socks with that skein – it has beautiful stitch definition and would make the cables sing. Now, the hard part would be choosing the best cabled sock pattern from the many in my Ravelry queue! I am not really a sock knitter (even though the pattern is beautiful and I will share it with fellow Ravlers) but I would use this skein to knit a stranded hat and some matching mitts. I shared this on Ravelry where I am rainbowscuba. I was looking for a nice sock pattern. I found it! I think I will use some skein queen sock wool to knit these socks… and the blue sundara yarn might look nice on a pair of socks as well! Having just finished my first pair of socks, I would love for this to be my next project! Congratulations! Best of luck on your new adventure! Love the sock pattern and hope we will see more designs from you. I love the Sundara yarn and think I might try making a cowl out of it. So soft!! Love the socks! I’m always amazed by people that can write patterns. You chose such a beautiful blue yarn. It’s one of my favorite colors. Congratulations! That is a beautiful blue! Thanks for the fun. Thanks for sharing your creativity. The socks look great, I would love to make them in the Sundara yarn.